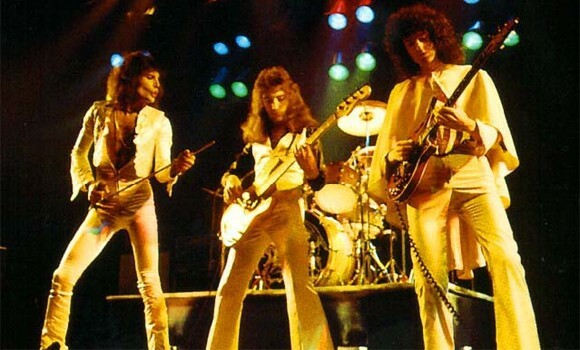 I'm not sure how many of us play Rock Band, here's a thread for all the weekly dlc so everyone knows whats available. * Dinosaur Jr. -- "Pick Me Up"
* Dinosaur Jr. -- "The Wagon"
* The Guess Who -- "Hand Me Down World"
* The Guess Who -- "No Time"
* Tenacious D -- "Rock Your Socks"
* Tenacious D -- "Tribute"
I'm an American Caucasian male between the ages of 25 - 40, so I am of course a Pearl Jam fan. Despite this, their last album was complete shite. The two before that were "meh" at best. I will not be dusting off my copy of Rock Band for this DLC. It only takes two days to become the quickest seller in the series' history. Microsoft has announced that 'All You Need Is Love' has become the fastest-selling track in Rock Band's history. The Beatles' track costs 160 Microsoft Points, with some of the proceeds going to Doctors Without Borders, a charity personally selected by Paul McCartney, Ringo Starr, Yoko Ono Lennon and Olivia Harrison. * Alanis Morissette -- "Head Over Feet"
* Alanis Morissette -- "Ironic"
* The Flobots -- "Handlebars"
We wonder if they'll be available as a collection called "All The Good Ones Except for Bohemian Rhapsody." Forget that Jack White finds it "depressing" that kids are learning about music through rhythm games -- there's gold in them thar virtual hills! 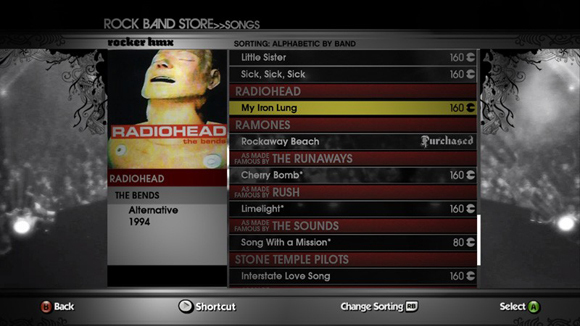 Next week's Rock Band DLC adds a pack of songs from The White Stripes, with tracks off of three different albums. 2 of my Top 10 White Stripe songs. I predict I'll be buying this next Holiday my family gets together. I can do a great Jack White on vocals ... which isn't exactly a good thing. A recent press release has informed us that with the release of today's Rock Band 2 DLC pack, Harmonix has met its goal of having over 1,000 songs on the platform before the holidays. According to the presser, these tracks represent the work of 390 musical artists. The rhythm gaming community has downloaded over 60 million songs from the Rock Band Music Store, which Harmonix has kept alive and kicking with new musical additions for 105 consecutive weeks. To put this achievement in chronological terms, we'd estimate that the average length of these songs is, oh, about four minutes. By our calculations, a full playthrough of the Rock Band catalog would take you two days, 18 hours and 40 minutes. Not accounting for the number of times you'll inevitably fail out on "Painkiller," of course. Congratulations, Harmonix, on this rocking accomplishment! Now, get back to work. That Paul Simon track pack isn't going to program itself.